Paper money, invented by the Chinese, first appeared in the West in the 13th century. Brought back from China by Marco Polo and his uncles, author Ralph Foster describes the West’s reaction to the hitherto unseen phenomena of money as a piece of paper. The Emperor of China (who we call Kubalai Khan) gave the Polos a camel loaded with 1,000 cash paper notes as a gift from their sovereign. The doge (chief magistrate of Venice) and the cardinal (the Pope’s cousin) looked at these…notes in awe and dismay. The hen-scratched writing was not in Latin or Greek but in a secret language, most likely the language of the Devil. They proceeded to burn these notes and accused Polo of heresy. pg 38, Ralph Foster, Fiat Paper Money: the History and Evolution of our Currency, 2nd ed. In retrospect, the disturbed reaction of the Venetians was not without cause. For when paper money was later issued in the West, it was to assume a far more sinister guise—no longer was money a savings-based instrument of exchange as it had been throughout human history. In the West, paper money was to become an integral part of a scheme to profit by the spread of debt, i.e. usury. The human species, according to the best theory I can form of it, is composed of two distinct races, the men who borrow, and the men who lend. The above quote is from Will Slatyer’s The Debt Delusion, Evolution and Management of Financial Risk (2008). In his remarkable book, Slatyer traces the origins of debt to before the coinage of gold and silver. Debt distinguished the West’s paper banknotes—issued from central banks in the form of loans—from China’s paper money issued by the state. In the West, however, debt was to replace savings as the basis of commerce. Ralph Foster notes: Jews doing business in China observed and studied the use of promissory notes, vouchers, draft notes, and negotiable certificates of deposit. They saw how this paper circulated freely among the general population rather than only among merchants. Eventually, they adapted these financial instruments to their own use—long before the first Christian travelers had even heard of them. Europe was thus an indirect beneficiary of eastern financial knowledge. Max Weber, the famous sociologist, recognized the importance of Jewish contributions to the development of capitalism and lectured on their common oriental origin. pg. 34, Ralph Foster, Fiat Paper Money: the History and Evolution of our Currency, 2nd ed. Ralph Fosters’ Fiat Paper Money: the History and Evolution of our Currency explains how China’s paper money came to the West: Those who benefit from fiat money’s devious gifts would rather its origins remain forgotten. Thanks to Ralph Foster’s scholarship, however, the history of fiat money is now known. When the Scot, William Patterson, proposed his idea of a central bank to King William III of England, banks and paper money were unknown, at least in the West. In the East, paper money had for 600 years led to reoccurring episodes of runaway inflation and the collapse of dynasties. Finally in 1661, China outlawed paper money; and thirty-three years later, in 1694, paper banknotes became accepted as money in England. Patterson’s central bank combined paper money with usury, i.e. money-lending. In Patterson’s scheme, money would henceforth be issued as loans from banks, i.e. if all loans were repaid, all money would disappear. Earlier, the Venetians had feared China’s paper money was the work of the devil. They were wrong. Patterson’s money was. The underlying purpose of Patterson’s central bank was not to replace gold and silver with paper money (although it eventually did) but to instead profit by the charging of interest on the loaning of paper banknotes as if they were gold or silver. 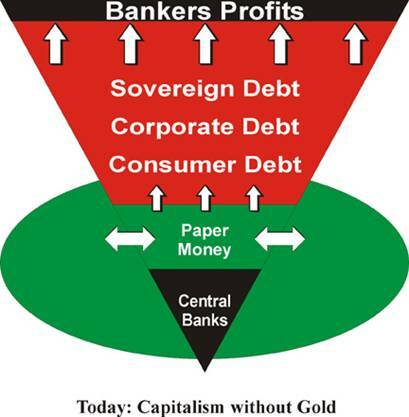 Debt-based money issued from central banks on which interest accrues is the basis of capitalist economies. In capitalist economies, central banks are engines of credit which emit debt just as internal combustion engines emit carbon dioxide. Debt accruing from money issued by central banks constantly compounds and unless capitalist economies also constantly expand, constantly compounding debt eventually overwhelms all economic activity, resulting in ’parcus nex’, i.e. economic death. It is the charging of interest on money issued as loans from a central bank that is the foundation of capitalism. It should be noted that prior to capitalism, charging interest on money lending was considered immoral by Christians, Muslims and Jews alike. Outlawed by Islam, considered by the Catholic Church to be a sin and contrary to the Law of Moses, because of William Patterson’s combination of money and debt, money lending is now the basis of all modern economies. Jews, barred from all trade guilds in Medieval Europe, were allowed only two avocations in the Middle Ages, that of money lending and the selling of used clothing. It is not without irony that the once shunned practice of money lending has now catapulted Jewish bankers to their pre-eminent position of power and wealth in the world today. The Catholic Church’s ban on usury, i.e.money lending, came originally from Talmudic law which banned Jews from lending money at interest to other Jews. Jews, however, interpreted this ban as still allowing them to lend money to non-Jews. In Hebrew law, an indulgent perception of usury meant that one could loan at usury to a racial alien or one not of the Jewish faith…In early Palestine, loans with interest had been allowed to gentiles and Samaritans, and the practice had spread to Europe. pg 17, Slatyer, The Debt Delusion, Evolution and Management of Financial Risk (2008). Today, some three hundred years after William Patterson introduced central banking’s debt-based paper money in the West, the centuries-long prohibition against money lending is as long-forgotten as China’s 600 year history with paper money, hyperinflation and dynastic collapse. When capitalism—institutionalized money lending in debt-based economies—became the world’s predominant economy, bankers found themselves temporarily on top. The operant word is temporarily because where credit and debt is concerned, that which goes up always comes down. 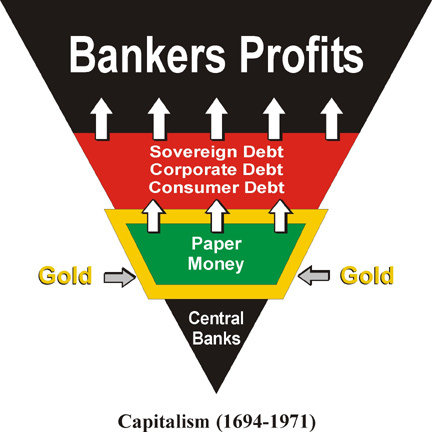 In 1971, capitalism began to unravel when the US was forced to suspend the convertibility of the US dollar to gold. Without gold’s constraint on the money supply, governments—especially the US—began printing and borrowing money virtually without limit. Today, that limit has been reached. William Patterson’s 300 year-old house of cards and credit is now collapsing as defaulting debt consumes what’s left of savings. Despite the efforts of governments to save the system that allows them to spend money they don’t have, the end of the banker’s reign is near. Since the advent of paper money, bankers have tended to form an unholy alliance with elected governments to expand debt. Both prosper until the time when debt cannot be repaid. The chartering of the Bank of England changed the course of history. Central banking allowed governments to go to war on credit, an advantage England parlayed into world dominion over the next 150 years. The collapse of Chinese dynasties caused by the excessive issuance of fiat money is about to be repeated, albeit in a modern iteration and on a much wider scale. The recent and unprecedented increase of credit in China and the negative interest rates in much of the world are no less consequential than the excessive printing of fiat money that caused the serial collapse of five Chinese dynasties. 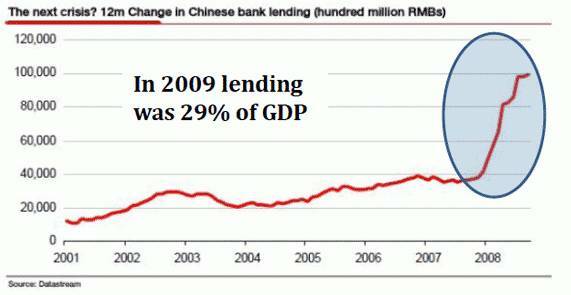 The slowing of the global economy in 2008 was met with an immediate flood of fiat money from China hoping to reverse the severe economic contraction. It worked, albeit temporarily and at a perhaps fatal cost. The flood of fiat money in 2008/2009 set in motion inflationary forces that will dwarf the inflation of the late 1970s that in the US sent gold surging almost 2300 % between 1971 and 1980 (9 years); shaming the Dow’s historic rally between 1982 and 2000, an increase of 1500 % over 18 years. The rise in gold and silver prices has been underway since 2001. The process itself has been underway since 1971. There is further to go and the price rise will be steeper. In an interview with Ralph Foster, I discuss this process with the noted author and gold and silver dealer, see http://www.youtube.com/user/SchoonWorks#p/u/0/pFx9EfM_Ugs. China may well play the unfortunate role for the world economy that it did for its own for five successive dynasties. China is once again issuing excessive amounts of fiat money. Then, governments fell. Today, they will fall again; and when they fall, the price of gold will rise vertically. “You can’t eat gold” is a sophomoric assertion intended to dismiss the value of gold in times of severe economic crisis. Professor Antal Fekete who lived through such times, i.e. the post-WWII Hungarian inflation, simply dismisses this absurd statement by answering, “You can always eat what gold will buy”. I was fortunate to learn much about the Austrian school of economics from Professor Fekete. The Austrian school holds that human choices and interaction play causal roles in economies, i.e. Human Action by Ludwig von Mises. I recommend that for those interested in matters of economics, there is no better venue for discussion than with Professor Fekete, a man of towering intellect, humor, compassion and a concomitant love for discourse and argument. From August 20-29 in Munich, Germany, Professor Fekete will lecture on The Austrian Theory of Interest and Discount. He will be joined by Sandeep Jaitly whose study of the gold and silver basis, an area first explored by Professor Fekete, has led to the basis as a strategy for profitably trading gold and silver. The Austrian school of economics emerged at a time when communism and socialism were offered as alternatives to the capitalist model. Because of the central role of government inherent in communist and socialist models, the potential for tyranny was obvious. Quigley was a professor at Princeton and Harvard Universities, and later at the School of Foreign Service at Georgetown University where he was a mentor of Bill Clinton. Quigley’s observations are to be valued as they are an insider’s look at the activities of powerful elites who use government and commerce to accomplish their aims and disguise their activities. The powers of financial capitalism had another far reaching aim, nothing less than to create a world system of financial control in private hands able to dominate the political system of each country and the economy of the world as a whole. This system was to be controlled in a feudalist fashion by the central banks of the world acting in concert, by secret agreements, arrived at in frequent private meetings and conferences. The apex of the system was the Bank for International Settlements in Basle, Switzerland, a private bank owned and controlled by the worlds' central banks which were themselves private corporations. The growth of financial capitalism made possible a centralization of world economic control and use of this power for the direct benefit of financiers and the indirect injury of all other economic groups. The global economic collapse is perhaps humanity’s greatest hope for escaping the debt slavery the world’s financiers and bankers have planned for the world. However, to escape slavery one must first know he is a slave. Man’s wisdom is most conspicuous where he is able to distinguish among dangers and make choice of the least. When I discovered others in the PDN shared my concerns about the US economy, I began writing down my thoughts. In March 2007 I presented my findings to the Positive Deviant Network in the form of an in-depth 148- page analysis, " How to Survive the Crisis and Prosper In The Process. " The interest in the book and my writings has been gratifying. During its first two months, www.survivethecrisis.com was accessed by over 10,000 viewers from 93 countries. Clearly, we had struck a chord and www.drschoon.com , has been created to address this interest. The history of the evolution of money has always been highly politicized to the extent that arriving at an accurate and unbiased account of the phenomenon is nigh on impossible.